It was like going to your grandmother's house for Sunday brunch. Sitting by the window of a renovated townhouse, sipping on a big mug of coffee, wrapped in a big chunky sweater, something like your grandfather would putz around in. It was all so cozy. They say that couples who brunch together stay together. Mr.S took me to b bistro in Bolton Hill. I had wanted to go to IHOP. In retrospect, his was a much better brunch choice. The brunch menu is small, which I appreciate since I am the world's most indecisive person. Give me a large menu, and I'll be sitting there for hours wringing my hands. Split up into omelets, and benedicts with 3 variations each, pancakes, a breakfast burrito, and some other breakfasty things, the menu is very straightforward. I had traditional eggs Benedict with Canadian bacon. 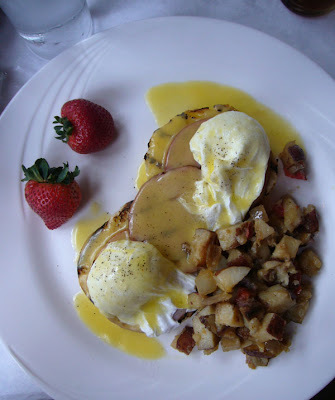 The yolks were perfectly cooked, the Hollandaise nicely balanced between light and rich. The potatoes however, were slightly wet and mush-like. 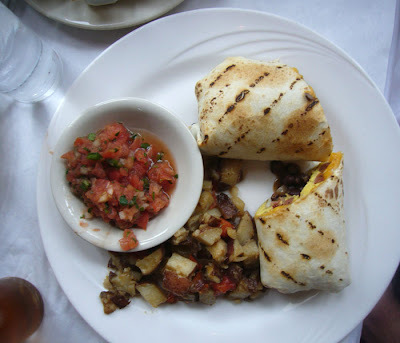 Mr.S's breakfast burrito was good, with the best part of the dish being the fresh salsa, with like, a ton of garlic. For the filler, there was a generous portion of scrambled egg, sausage, black beans and onion. I’ve been meaning to brunch at b for ages…your little review just reminded me that I need to go there, and soon! Bought the Tennis Racquet is important, exercise can reduce the harm, especially for the wrist injury. But the good of Tennis Racket in general in the real prices are more expensive, so a lot of websites now have cheap tennis racquet,tennis racquet discount,cheap tennis racket,discount Tennis Racket . you’ll hear a lot more Burbrery Polo Shirts of in the future I’m sure. some new style Air shoes is in fashion this year.Do you know Air Shoes is a best . another kinds of nike air rift is better . the Puma basket will make you feel very relaxed when you play basketball. If you want to buy the Cheap puma shoes shoes ,you can buy them online. Very high-caliber and cheap puma shoes as same as you buy from the authorized store.